Structure and hat in transparent or smoked gray or dyed opaque in gray or white with polished chrome-plated 24K gold, or the internal version 24K gold-plated deluxe completely. Thanks to a special coupling system on the hat, you can get three different heights changed at will by: cm h 63, 73 and 78. 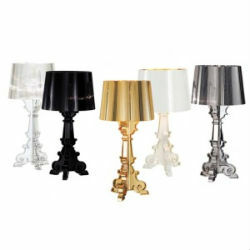 Mood lighting for the table, desk, bedside table, living room or as a simple floor-standing sculpture. Available in stock colors: Clear, Grey and White Polished Chrome plated with 24K gold interior.